I came across your site online when doing a search. I have a quick question about alterations on my silk bias cut wedding gown. I fell in love with it at a sample sale but it was about 2 sizes too big. I was concerned about rippling along the seams in the front but was told by the boutique that it could be altered without problem....however when I brought it to the alterationist (is that the correct word?) she said that she could take it in along the back seam where the zipper is but that it would be impossible to eliminate the rippling along bust and hip in the front because of the bias cut. She said to take it in at the side/front seams would only worsen the rippling effect. Is this truly impossible or do I need to find another seamstress? I've attached photos after the dress was pinned. In one a sash is used to distract from the ripples although the overall style of the dress is certainly changed. Thank you very very much! Kat. Bias cut fabric is notorious for doing this. It is not easy to fix and someone with no bias experience probably wouldn't know how to attempt it. It can be helped by releasing and hand sewing the seams, but that might not totally eliminate all the ripples and it's a delicate and extremely time consuming task. Steaming can also help. Even if you changed ladies, you might still have some rippling. I can't see from the pictures - are there side seams? It's usually proper to do sizing at the side seams. You may be creating the ripples by pulling it at the zipper. The front part of the body is relatively flat where the hip area is curvy. When you pull at the zipper the whole dress shifts to the back and the flat part of the front is pulled into the curvy area at the hip and can cause rippling especially in bias fabric. I hope this helps answer your qiestion. I'm hiring a couture designer to make my wedding dress. I would like to make sure that everything needed is covered in the contract. Do you have a list of what should be covered in a contract? I sure would appreciate any help you can provide. Have a good talk with your seamstress and discuss every point that is in the contract and make sure you understand it before you sign. If it doesn't stipulate specifically in there you do need to understand that good communication is vital to getting what you want. At each step along the way you need to give your seamstress feedback about the work in progress and your opinions of it. This is a process not only of her designing and sewing the gown but of getting to understand you and how you want to look in this gown. The more feedback you give her the more likely it will be that you get the gown of your dreams. I just found your site and have been reading through it, and it seems to offer a lot of great advise and solutions. I just bought a wedding dress that I am completely in love with. It is not off the rack and because it had to be ordered, it will be several months before it comes in. The dress has some beading on the skirt and when I tried on the floor model, the beading would sometimes catch on the fabric. The consultant said it was because as a floor model, the dress had been tried on many times and as a result, the beading was "worn out". Are there any preventative measures I can take with the beading to prevent it from catching on the fabric? "worn out beading"? That's a new one to me. Some beading can have a tendency to catch on things. Sometimes it's the beads themselves and sometimes it's the loose stitching. If it's the loose stitching you could restitch all the beadwork, but that would be a really big job. If it's the beads there's really nothing you can do about it. To avoid catching you need to walk carefully and avoid fast movements that will let the fabric of your gown rub on itself. This should be normal for a bride anyway. You are the princess for a day and should be moving with grace anyway. I'm new to your site and, absolutely love the advice that you have given. I purchased a Forever yours discontinued gown, the bodice is a tank style scoop neckline, with lace cap sleeves attached, and a full tulle skirt with chapel train. 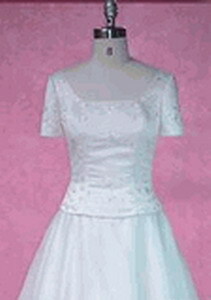 The bodice is embroidered and, has silver beading as well. The chapel and hem of the tulle skirt has a silver lace. Unfortunately, back in August of 2007 I was advised my Kidney transplant I had back in 1997 is failing. As of January 2008, I have been on Dialysis treatment three times a week and, the catheter was placed on the right side of my upper chest ( as high as the collar bone ). This presents a major problem for me because, due to the scoop neckline the catheter is in a place for all to see. I purchased this dress a year ago because, I loved it so much and I got a great deal for it. I don't know if the bridal shop would even exchange it for another one. I was thinking of perhaps redesigning the bodice. However, I can't think of anything that would cover this bandaged site without looking hideous or tacky. Attached I submitted a similar gown, except this gown of course is no where near as pretty and elaborate as mine. My question is whether or not I can detached the tulle skirt and redesign a bodice and create a two piece gown ? or Would you happen to have any suggestions on redesigning the bodice and, add a creative yet attractive element to cover the catheter. Something that would still make the dress look as though it was made that way. It hurts me to have to see this dress go because of this flaw ! " I'm desperate and don't know what to do " ! I have seem gowns that have this sort-of neckline but the neck is filled in with a netting fabric and lace is creatively sprinkled in the neck area. This idea is great for you because your skirt is tulle. If you can find similar lace, you can create a lovely neckline. All you have to do is place the lace heavily in the catheter area and looser other places so some skin shows through. The trick is the similar lace. It does not have to be exactly the same, just close enough. Once you have figured out the covering factor, place some lace so it travels into the bodice area. That way it will look as if it was designed that way. Am I making sense? I had a quick question - After my wedding ceremony, my long veil ripped in a small area - is there anyway to repair the veil (I was hoping it would be something I could pass down as an heirloom). The only way to repair that type of material so it doesn't look ghastly, is to replace the tulle. I have what I think is a rather odd dress situation. I went to my local boutique, tried on dresses, and picked a Nicole Miller (attached photo). I loved the sample, bought a few sizes down, and received the dress a few months later. 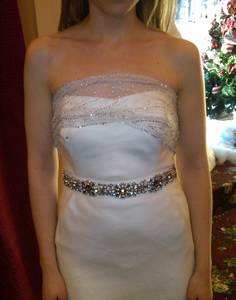 The dress I received was nearly identical to the sample except for one small but VERY noticeable difference. The two slips on my dress have seams at the high waist that are like a hem, two fabric pieces sewn together with an inch of extra fabric folded over. The folded over fabric makes a much darker white than the slip itself, and shows right through the dress! It's very unsightly, noticeable, and disappointing. There's an inch-wide dark white band showing through the dress at the waist, and it's all i can look at! I'm wondering if there is any other way to sew the slips so that there is no extra fabric, without making the seam too fragile. My first thought was to simply cut off the excess flap of fabric, but I'm afraid the seam would just fall apart if I did that! You can't see the problem in the picture you sent because the mannequin the dress is on is white. Can you buy a white undergarment that will fit under the dress? The issue is that I'm 5'3" and around 260lbs. This is all well and fine enough for me and my fiance, but I have terribly difficult to work with proportions. My bust is approximately 58 inches with a band size off 44 [with E or F cups] but my waist is ALSO 58-60 inches. Websites keep telling me that an A-line dress will look great on me, but I've had lots of difficulty with them fitting. The only dresses that fit me well are empire, but I'm really struggling to find some. Is there any way to take an A-line or Princess styled dress and make it fit my awkward proportions? Also, I know to buy the dress for my stomach size but do I need to be really concerned about getting the bust to fit? I normally wear a size 24 and the literature says that a size larger or two would suffice, but according to size charts, I seemingly often need a size 32... Should I trust them? Lastly, should I start considering splurging for a custom-made dress from a seamstress or such drastic measures aren't so necessary. You are going to have a very hard time getting the bust to fit when you order for the stomach measurement. It is very hard to alter the bust area and have it look good. I would advise you to go with the custom job if you have a seamstress in your town that will do it. It will probably cost about as much as buying a dress and paying the hefty alteration fees but with less stress. Was the chain sewn on the edge of the tulle in the original? Or was it glued? If it was glued than you certainly can reglue it. THere is a glue made by Aleen's that is called Flexible Stretchble that would work great. If the chain was sewn on originally, it is best to resew it. I am thinking from your description that this is a napkin edge serged chain. If you do not have a serging machine you can not resew this edge correctly. It can not be done on a regular sewing machine and look great. You might be able to sew the existing chain back on and have it look ok, but it would be best to use the serger to recreate the napkin edge. I just came across you website, and wondered if you could help me. I've got an intensely big ball gown with an 8 ft train, but my wedding is 15 000 miles away from where I live. My fiancee and I have decided to courier the dress by Fedex next day, rather than risk airport security turning it away. I'm packing my dress in a very large box, so it only needs one fold, but the train will definitely have to be folded in. I am worried about the dress being wrinkled, and am told that I should get it steamed before the big day. However, I've also read that steam should not be used on satin and silk, at risk of them looking mottled after. My dress has heavy beading, pearls, and swarovksi crystals, so I am also concerned about whether steaming will be delicate enough for this. Calling ahead is the key to traveling with a gown. Most airlines will let you carry it on and place it in the first class closet for the trip. It's up to you, but I would never mail it. I would not let it out of my sight. You can have it professionally steamed at your destination. A dry cleaner will know how to take care of the fabric. Again, call ahead and reserve a dry cleaner to do this. You can do it yourself but you sound like you are not confident about the idea. It is really not as risky or difficult as you are fearing. Satin can be steamed but it's usually not recommended because most people aren't professional dry cleaners and don't have the professional equipment. If you fall into this category I highly recommend that you do not try to steam this gown by yourself. You can find a dry cleaners in the town you are going to and reserve a place for them to steam the gown. The hotel you will be staying at can help you with this. I am VERY concerned at shipping any gown. I would never let my gown out of my sight. Call the reservation desk of the company you are flying with and tell them you will be traveling with a wedding gown. They normally will let you carry it on and will usually hang it in the First Class closet for you too. I'm so glad to find your site! 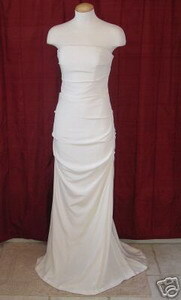 I just bought a sample gown from a posh salon in San Francisco, Priscilla of Boston #3002 made of silk taffeta. Of course, when I got it home the zipper broke. Can you make a guess as to what it would cost to replace the zipper on this gown? It zips halfway and then the zipper is torn (the tiniest bit) from the fabric attaching it to the gown. Is there an alternative to replacing the zipper? The buttons are functional over the zipper, so would hooks work? I really don't know anything about this stuff! Also, I'm hoping to find a high enough shoe not to need a hem...I'm almost in the clear with a 3.25 heel... but I'm wondering if a crinoline or petticoat would help the dress hold it's a-line shape and thus not need a hem. The store gave me the names of some alteration studios, but I can hazard a guess that they are as expensive as the salon where I bought the dress... so I thought I'd better go into this with some ballpark ideas of the costs I'm up against. Zippers can be replaced, but you might not need that. From what you have described, I think the zipper can be resewn to fix it. Taking out the old zipper completely and sewing in a new one will be costly. Petticoats do have the effect of raising the hem. Many brides this year have not liked that look, but if that ok by you it's a good alternative to hemming. Most independent sewing specialists are not as pricey as the salon alterations are. A salon has more overhead expenses and has to make more money so generally their prices are higher. Give one a call and ask some questions. You won't get specific prices, but she should be able to give you a range. Prepare a repair kit with needles and thread (the color of your gown) and extra hooks, etc. You can also have some large safety pins ready if you don't want to sew repairs. Do you have a basement? Put a sheet on the floor and hang it from a rafter. There are usually many nails around for you to use. If there are no nails, you can bang one in wherever you like. How do you store the gowns before the weddings? Right now we are storing them in zippered plastic bags, but some of these gowns aren't going to be worn until "98. We have heard that we should put them in muslin bags to protect them. A couple of gowns have discolored in the bags. We are getting very nervous, especially about the gowns that are to be stored for a long period of time. Any help in this matter would be greatly appreciated. If you can store them in the dark either with bags or in a closet. There are lots of views on the type of wrapping that is best. I've worked on many vintage gowns that were stored in various ways: Wrapped in white sheet, blue tissue, white tissue, and professionally sealed. They all seem to fair the same. Some of the best preserved were not kept in any special way at all. So I feel the key is darkness. Therefore, your muslin bag idea is great. You could buy a couple bolts of muslin when it goes on a half price sale and make up several bags. Put a pocket on the outside for identification papers and you'll have a very nice storing system. I once bought a bolt of upholstery fabric and made a dozen zipper bags for when I go to Trade shows. It looks so impressive to walk in with a rack of identical bags. And they hold up better than plastic bags. On your bags I wouldn't bother with zippers unless you really want to. You won't be traveling with them so you can easily design them to lap over for the opening in the front. And when hanging they will provide the protection you need. Hi, I've been perusing your web site after ordering my DTD PDF, and was interested in the gown storage section. You're dead right about light, especially sunlight. Exposure to the radiation erodes the fibers, in much the same way that exposure to sunlight damages skin cells. Unlike the body, a wedding dress cannot manufacture new cells and silk fibers, so the fabric degrades. Granted, the fibers of silk or more like hair fibers than skin cells. But we've all seen sun damaged hair. I think Pottery Barn is doing it's customers a huge disservice by selling silk dupioni drapes this season. They will disintegrate. But I digress. In my experience, plastic is a major part of the problem with storing natural fibers like silk satin and charmeuse. Silk is a natural fiber and needs consistently dry, coolish (60-70 F is ideal) air for long term storage. Silk stored in plastic bags and boxes will still react to temperature change as the gasses in the bag expands and contract with the temperature: the silk fibers will expand and contract too, but never have fresh air circulating around them. Like an Egyptian tomb of depleted air. I learned this the first time the hard way: I stored a perfectly wearable, albeit delicate, sage green silk 20's party dress in a zippered plastic bag. When I took it out of storage about 5 years later, the silk literally shattered and disintegrated in my hands. Since then, I've learned from experts about silk storage and haven't had any more first hand disasters! A note on garment bags: I make my own by purchasing 100% cotton, white twin-size flat sheets for a few dollars on sale at Target or Ross. (these are for client bags. For my own, I get cotton sheets at the thrift store). The edges are all nicely finished for me. All I have to do is fold one in half length wise, stitch up the long side and then along "top" of the bag, skipping two inches in the middle leaving a hanger opening. I leave the bottom open, but a zipper could be added. One can turn and press the seam, or not, depending on how necessary it is to have a "finished" bag. Moths, are of course, equally nightmarish to silk. I use tulle to make little net bags for moth balls, tie a ribbon at the "neck", and hang it from the hanger, over the cotton sheet garment bag. The way to avoid this is to start with plastic pants hangers, and very thickly pad the horizontal bar with terry cloth--dishtowels are great. Then drape the dress through all the of the hangers, so that there are roughly 10 vertical inches of dress draping between the hangers. Loosely secure the hanger necks together with a ribbon or some such, and then store the dress in a cotton garment bag. I don't feel that these types of gown should be folded as the long silk fibers tend to become weak at creases over time, and it's inevitable that age will begin to show at the folds. The heavily padded hangers keeps these creases from ever forming.